Chicago is a huge, old city with rich and great history. Similarly to most big cities, Chicago too has a problem with traffic jams that don’t sit lightly with neither locals nor visitors. However, the absolutely horrible traffic has never posed as an obstacle to those who are looking to explore all the amazingness that comes with the city: wonderful architecture to admire, history to learn, preserved hang out spots of old-school Chicago bad boys (yes, you still can have a drink there) and everything else in between. Sightseeing is a very popular touristic activity in the “Windy City” and pretty much anyone who pops over for a visit gives it a try. 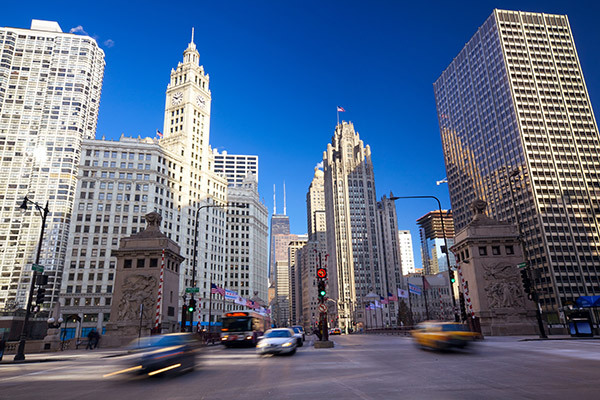 It is not uncommon for the locals to enjoy a little sightseeing as well which is why renting charter bus transportation in Chicago makes for one of the most popular activities to try. Tourists adore Chicago because of its cultural attractions, shopping, and fascinating architecture. It is a crossroad of contemporary architecture and art: architects such as Bertrand Goldberg and Frank Lloyd Wright and big names like Picasso and Chagall have left their mark in this very city, making it one of the most beautiful cities in the world. The sports arena is also very strong and popular, with the Chicago Bulls in basketball, the Chicago Bears in American football, and the Chicago White Sox in baseball. So, if you are a sports fan, you know what you’ll be adding to your must-see list! The Art Institute of Chicago is a high-class world-famous museum with an enormous number of artworks. Its collection is encyclopedic and includes pieces from a variety of periods – from Ancient and Byzantine works to the American and European modern and contemporary art scene. Apart from the phenomenal collection of paintings and sculptures that include photography, decorative arts, architectural drawings and much more, the Institute has a very famous collection of impressionists as well. Millennium Park is a downtown square with music pavilion, modern sculptures, public interactive works of art and 2.5-acre garden. It is the perfect spot for cultural programs, tours, and family activities. Michigan Avenue is the major commercial boulevard in Chicago and one of the most glamorous streets in America. The famous section of Michigan Avenue is the Magnificent Mile, the part of the street with numerous museums, restaurants, hotels and luxury shops. Main attractions along the boulevard are the Art Institute of Chicago, the Chicago Water Tower, John Hancock Center and the Tribune Tower. It can take a lot of time to visit all of these magnificent places. That is why when you are going sightseeing in Chicago your only choice should be a charter bus. The drivers are professionals who know the city and know how to find their way around it. Sure, you can rely on maps to give you a hint of the route to take but driving, parking, and handling Chicago traffic do need an expert, really. So, why not relax, book a black car service in Chicago and enjoy every second of it – especially if you’ve got a larger party going with you! Opting for a charter bus not only eliminates stress, walking for miles, queueing in the heat and getting lost but actually injects every tour in Chicago with excitement, relaxation, and a chill mind. Honestly, what better way to see the Windy City than have someone drive and show you around, right?